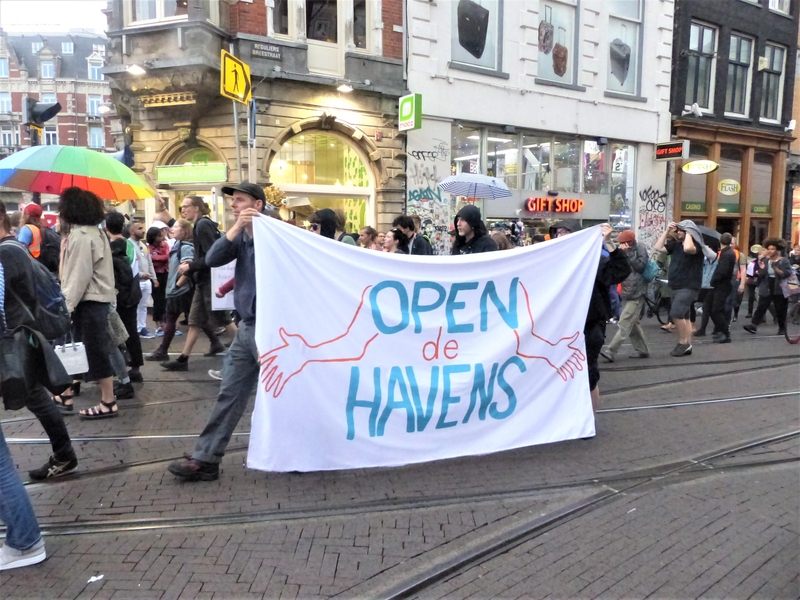 Open border demonstration in Amsterdam. With very few exceptions, liberals in the United States favor high levels of immigration; and the American left goes further, calling to "Abolish ICE" (a reference to Immigration Customs and Enforcement, America's border security agency). But developments in Europe suggest this near-unanimity could one day shatter. Since the end of World War II, Europe's left has overwhelmingly seen the free movement of labor and immigration as the best ways to challenge corporate interests; in the words of progressive writer David Adler (on whose article, "Meet Europe's Left Nationalists," I have relied here), these "hastened the pace of history and heightened capitalism's contradictions." Accordingly, the left helped build the European Union and then pass the 1985 Schengen Agreement (that virtually eliminated internal borders among 26 European countries with a population of more than 400 million). It also enthusiastically welcomed non-Europeans, an approach that culminated in 2015-16 with Angela Merkel (a leftist in conservative disguise) taking in a million-plus migrants, mostly from the Middle East, who were met in Germany by a Willkommenskultur, or welcoming culture. That massive influx, and especially the Islamists among them, stimulated a backlash among the left's historic base, the workers, leading them to desert it in favor of once-marginal anti-immigration and anti-Islamization parties, the ones I call civilizationist. These parties, with their mix of generous social benefits and strong border controls, are gaining throughout Europe to the point that they wield real power in five governments (those of Poland, Czechia, Hungary, Austria and Italy). Getting elected, leftists increasingly realize, means making what Mr. Adler calls a "momentous turn" away from both the single European labor market and migration from outside Europe; this doublet, they recently discovered, "encourages exploitation, erodes community, and denies popular sovereignty." Left nationalists criticize the free movement of labor for several reasons: Economic (jobs lost, wages undercut), cultural (loss of solidarity, xenophobia) and political (an elite project not endorsed by the masses). United Kingdom: Jeremy Corbyn, Labor Party leader, shadow prime minister and hard-leftist, says that "Labour is not wedded to freedom of movement for EU citizens as a point of principle" and calls for the "reasonable management" of immigration after Brexit based on UK economic needs. His colleague Diane Abbott puts it more simply: "Real border security ... is what Labour stands for." France: Jean-Luc Melenchon, leader of the La France Insoumise (France Unbound), a populist party, and the left's outstanding figure, denounces seconded employees from other European Union countries as "stealing the bread" of French workers. He lauds the French flag and national anthem (rather than their socialist counterparts) as "revolutionary symbols," a dizzying shift. Germany: Sahra Wagenknecht, co-leader of Die Linke (The Left) party, has spoken out against that welcoming of more than a million migrants in 2015-16, against open borders, and against granting migrants unlimited access to work in Germany. She founded an organization (Aufstehen, or Stand Up) to forward these ideas and it has touched a nerve, with more than one out of three Germans potentially favoring its tough approach. Of course, the nationalist version of socialism is hardly a novel idea but goes back to Benito Mussolini in Italy, who responded to the passions of World War I with an ideology he called fascism; more transparently, Adolf Hitler rode the National Socialist German Workers' Party, or Nazi party, to absolute power. Recalling those monsters, the current trend meets severe criticism; for example, Matt Qvortrup of Coventry University condemns Ms. Wagenknecht's fusion of anti-immigration policies with populist economics as "a dangerous mix." In contrast, I find the new iteration of left nationalism encouraging: Europe, America and Oceania need the right and left to cooperate in limiting massive non-Western immigration that threatens to overwhelm and even eliminate Western civilization. Mr. Adler notes that 40 percent of Democrats in the United States want yet higher levels of immigration than at present, in contrast to just 5 percent of Labor voters in the United Kingdom. Will losing voters cause the American left also to learn the hard way and then catch up with its Old World counterparts? It's just possible.